The increasing penetration of the smartphones in our lives signals that Responsive web design is not a trend anymore, it has become a necessity. The content must be flexible to be viewed on all the devices and platforms that users are using to access the business online. It’s important to make websites mobile optimized to ensure the page widths, layout, colors, fonts, graphics, texts and designs get auto-adjusted from the desktop to the palm-sized mobile without any image distortion, poor resolution, or horizontal scrolling. Claritaz global solutions helps businesses get a one-size-fits-all solution through responsive web development strategies that dynamically resize the content and eliminate the coding and management efforts for multiple interfaces. Why Claritaz Global Solutions For Responsive Website Development? 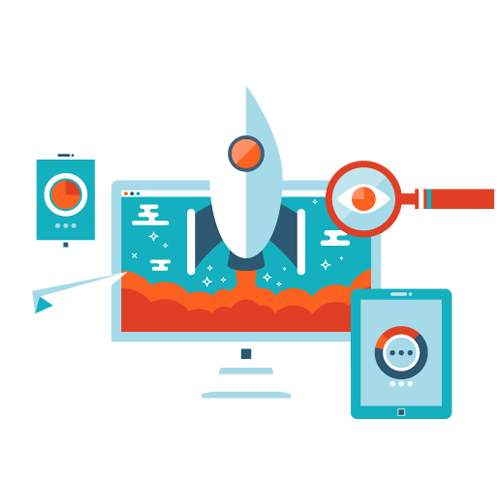 The company has a team of experienced professionals who engineer phenomenal responsive website designs leveraging CSS media queries and following the best-in-class design practices to guarantee that the website delivers an outstanding UI and UX on every screen size. The team ensures that the website responds to the fluctuating demand with high scalability and adapts to changes due to its responsive nature. Whether you want to create a new website from scratch or upgrade a legacy application, we guarantee creation of an online presence that helps you succeed in the modern age and win more customers. The website is the culmination-point for many businesses. Our website design and UI/UX design services will take care to create that enchanting first impression with your customers.